I was looking over my pile of comics this week to pick out what to review, and I was struck by a really cool realization: most of the comics in my pile star women! There was once a time, not too long ago, when female-led comics were few and far between. Oh how far we’ve come. So in honor of the first ever female major party candidate for U.S. President, this Hench-Sized Comic Book Review pile is dedicated to awesome superhero ladies! We’ve got your Batgirl, your Harley Quinn, your Pink Power Ranger, your Wonder Woman, your Squirrel Girl, your Ms. Marvel; just a cavalcade of awesome female superheroes! And each and every issue is a blast! I feel almost guilty for all the good grades I’ve given everybody. Comic Book of the Week goes to Batgirl #1, though it’s a hard choice to make. 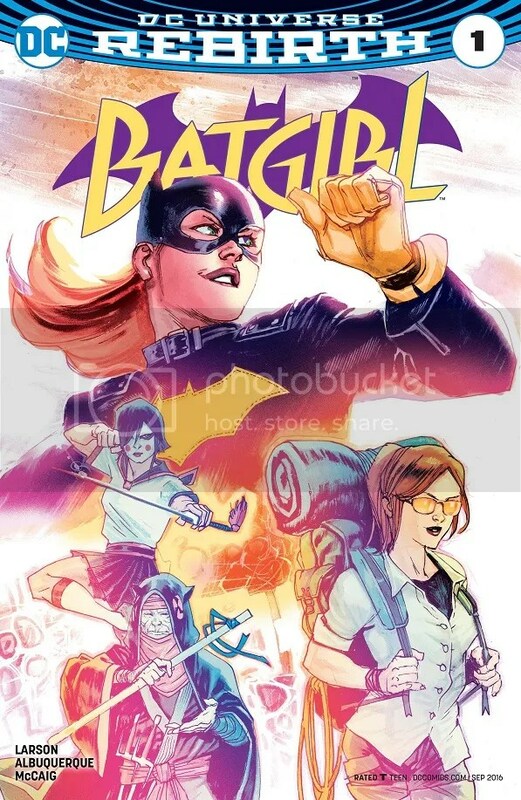 Most of the comics are mid-storyline, whereas the new Batgirl Rebirth relaunch nails the beginning and promises a nice new series. As for some of my other regular titles, Detective Comics is great, with more Tim Drake awesomeness. The first issue of Nightwing Rebirth is solid, but leans too heavily on some dumb new antagonist. And the new issue of Civil War II is a solid reminder about why I should stop caring. I also read the new Captain Marvel, but it was kind of lame, so it didn’t make the cut for my all-women week. Comic Reviews: Batgirl #1, Harley Quinn #30, Mighty Morphin’ Power Rangers – Pink #2, Mighty Thor #9, Ms. Marvel #9, Unbeatable Squirrel Girl #10 and Wonder Woman #3. I was a huge fan of Batgirl of Burnside, and I plan to collect the whole run in tpbs. I loved the character redesign, I loved the playful style of artist Babs Tarr, and I thoroughly enjoyed the stories. So while I’m disappointed that it’s over, I’m excited to see Larson and Albuquerque carry on the spirit. Barbara Gordon is in Japan on a soul-searching, back-packing adventure through Asia. Specifically, she wants to meet legendary Japanese hero Fruit Bat, who is now a retired, 100+-year-old woman seemingly confined to a wheelchair. Babs also runs into an old childhood friend of hers, Kai, who might be up to no good. The two of them tour the city, then meet up with Fruit Bat and her idiot aide at a parade downtown. At this parade, Kai is attacked by a warrior clown woman, and Batgirl leaps in to save him. But it’s Fruit Bat who really saves the day, showing that the 100+-year-old ninja vigilante hasn’t lost her touch. She tells Babs to find a teacher, and later Babs gets a sign that maybe she should sign up for MMA in Singapore (while keeping an eye on Kai). 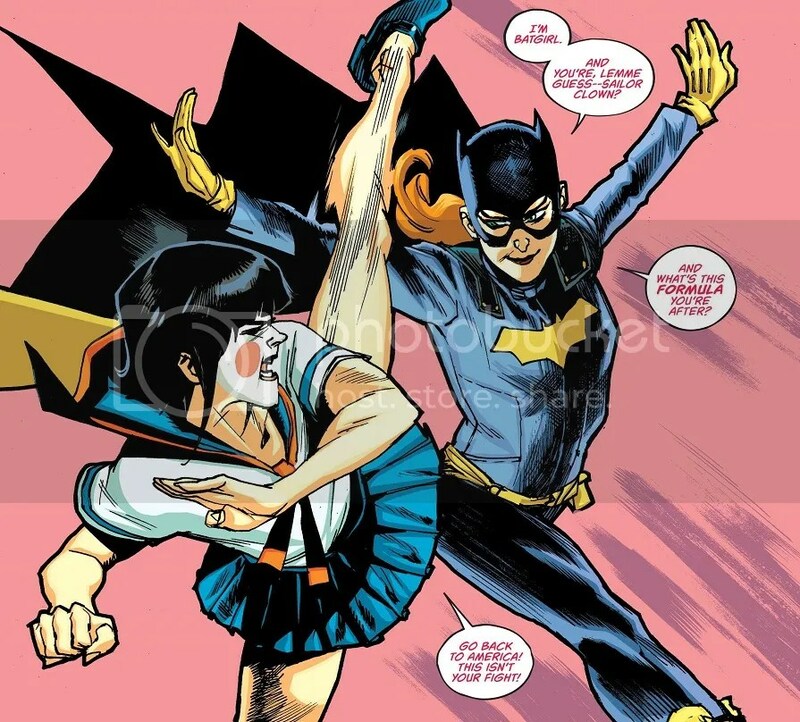 The style and fun of Batgirl of Burnside remains in the new international series. 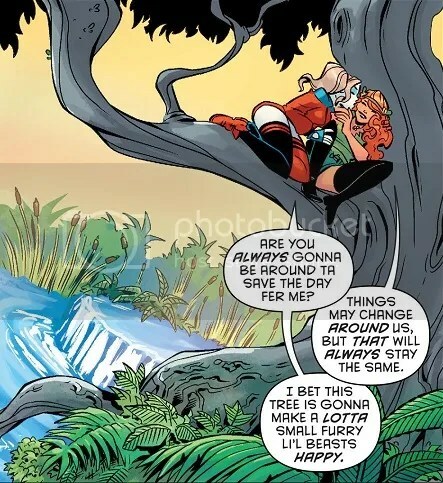 This is still a quirky comic, and Babs remains the fun, thoughtful and awesome character she’s been since forever. So I’m very pleased with that turn of events. Larson takes that Batgirl and puts her into a new international adventure of mystery! 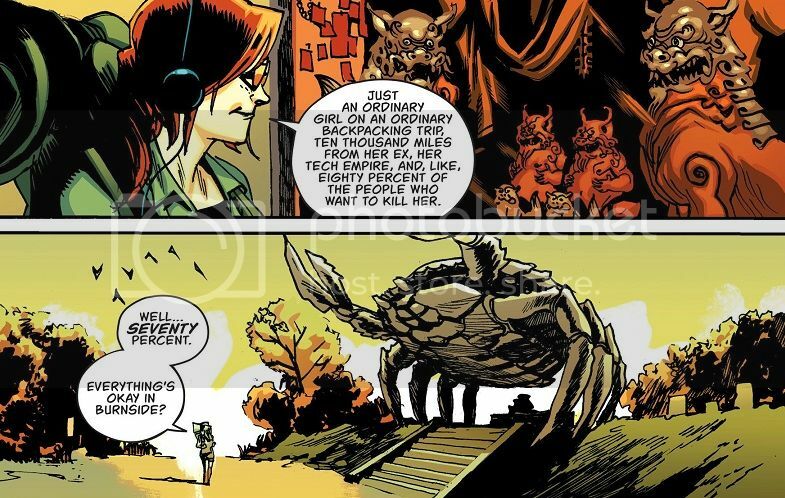 Barbara Gordon is the perfect sort of character to go backpacking around Asia. Seems like exactly her sort of vacation. I wanna go to Japan and see the giant crab! And Larson does a fine job building up her supporting cast. The arrival of an old childhood friend is kind of abrupt, but I suppose we run into people we used to know all the time. It’s a small world, right? But Babs looks to be getting a nice supporting cast, and it’s clear that the creative team has done their homework on the new worlds and cultures that Babs will explore. Albuquerque is a little rougher around the edges than Babs Tarr, but I like what I’m seeing here. I’m not entirely sure what’s in store for Harley Quinn in Rebirth. I’m pretty sure Conner and Palmiotti will be back, but she’s also going to get a worldwide boost in popularity thanks to the upcoming Suicide Squad movie. So who knows what might happen next! Harley has chained herself to a big tree in a Brooklyn construction zone, in protest of the crews knocking down plantlife to build a new apartment complex. But she’s got to go to work, so she gets Tony to fill in for her for a bit. On the way to work, Harley also teaches a sarcastic douchebag a lesson after he stole a seat on the subway that was intended for a pregnant woman. At the hospital, Harley finds out that a lot of residents are being scammed by telephone scammers, so she puts the Gang of Harleys on the case. And when one resident is sad that his pet bird died, Harley summons her flock of parakeets and he picks out one to be his new pet. Harley later returns to the construction site and leads a big fight between the construction crew and the people in the neighborhood, which ends with the construction boss smashing the tree with a backhoe. The guy thinks this conflict is finished, but Harley calls on Poison Ivy, and together they turn the entire construction site into a legally-protected marshland. Then the two of them snuggle in the branches of the tree as hey bid this volume of Harley Quinn to a close. I don’t know what’s in store for Harley Quinn, but at least this volume ends rather pleasantly. It’s a simple, done-in-one story that shows off some of the best of Conner and Palmiotti’s Harley. She’s a smartass defender of the innocent in all manner of funny, off-kilter ways. Whether it’s controlling a large flock of parakeets, thumping a douchenozzle on the subway or running down a man with a truck, Harley Quinn is a singular character. They’ve tapped into her greatness, and it’s no surprise that this is one of DC’s most popular comics. 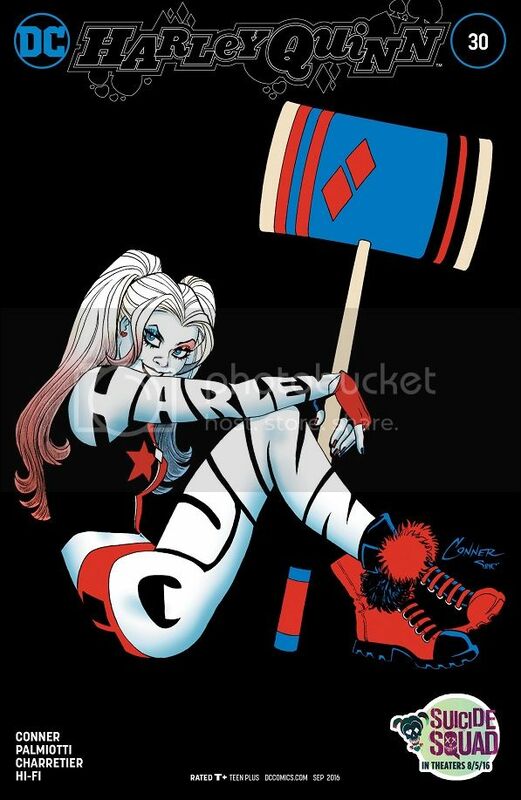 I can only hope that the upcoming movie slate does really well by Harley. I hope the Rebirth title hasn’t been given some insane directive that will ruin this fantastic take on the character. She’s just so much fun and so charming that I’m glad I picked up the first issue so long ago. I’d never particularly cared much about the character before then, but this comic is a real winner and deserves all of its praise. Also, I’m quite pleased that they chose to go out on another cozy Harley & Ivy scene. This is DC’s best romance right here. After uncovering Goldar’s evil plan to turn the townspeople into monsters (including her parents), Kimberly retreats and reaches out to Zordon for more help. Since the regular Power Rangers team is busy in outer space, Kimberly recruits Trini and Zack and uses the Sword of Light to imbue them with a bit of her Pink Energy. 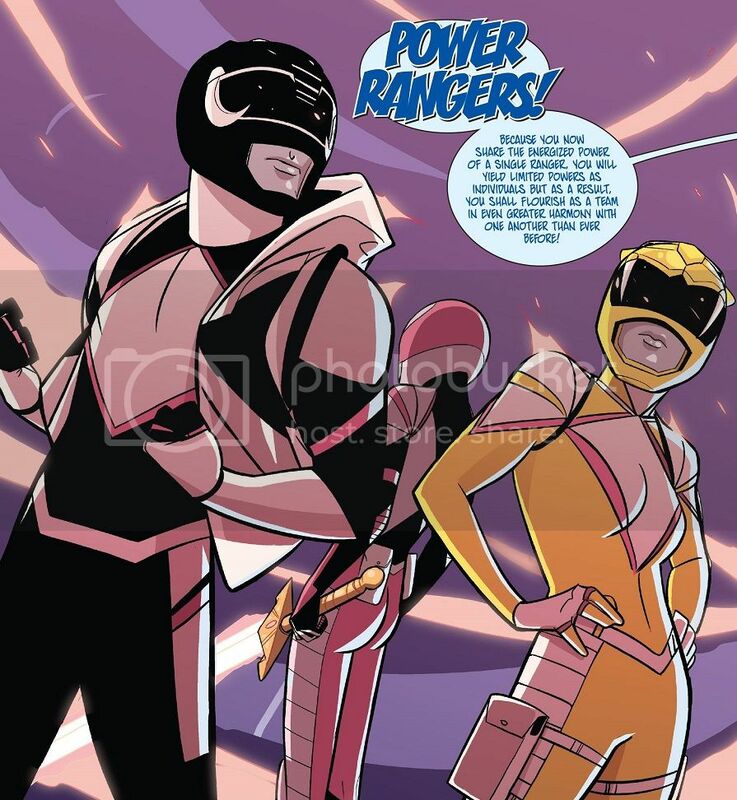 Sadly, they don’t also become pink rangers, but their new black and yellow ranger costumes have a touch of pink. It’s neat. Anyway, no sooner do they morph than they’re ambushed by Goldar’s minions and taken prisoner. When they wake up in Goldar’s lair, he uses the Sword of Light to power up a new Frankenstein Megazord, pieced together by old, abandoned Zords. And he declares that Kimberly’s friend Serge is a traitor who helped him set up the ambush. So, uh, why were Trini and Zack brought into this comic? It’s fun to see their lives post-Power Rangers, but we’re only two issues into this mini-series, which was supposed to be a Pink Ranger solo series. Now, all of a sudden, we’ve got two other Rangers in the comic, and they all get captured almost immediately anyway! Where the heck are Fletcher and Thompson going with this? I mean, it makes sense that Kimberly would want back-up, and seeing Trini and Zack again is cool, but Fletcher and Thompson are writing this story from top to bottom. They designed the threat. Why not tell a story where Kimberly gets to remain solo? Though the pinkish costumes are kinda neat. This was a fun issue that made some weird choices. Kimberly is a darn cool protagonist, and her character is really strong and exciting to see in action. 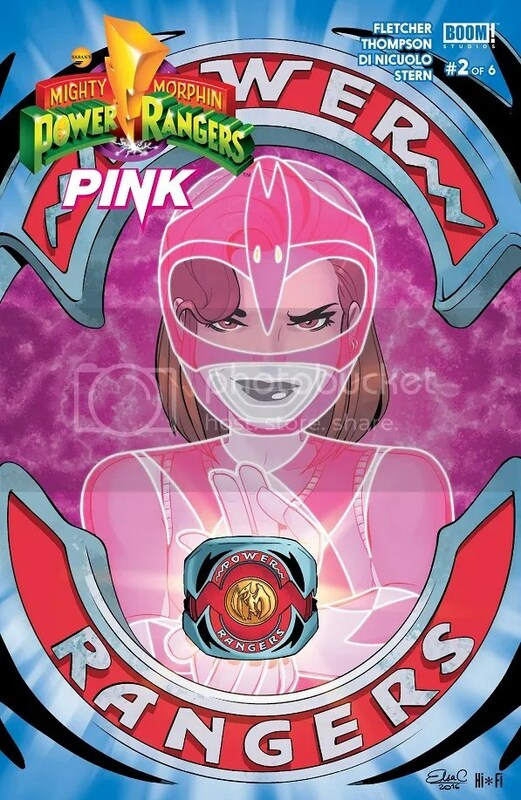 The scenes where she recruits Trini and Zack are a blast, and I hope this is all in-continuity with the other Power Rangers comic. It would really expand the scope of this whole comics franchise. I look forward to seeing the Rangers get out of this mess, but I am a little curious why they’re in this mess in the first place. Jason Aaron has been telling one heck of a Thor story. I never cared about the character before, and my last attempt to get involved was the J. Michael Straczynski run, which he aborted early like a lot of his projects. I really hope Aaron is going the distance on this one. The issue opens with a quiet moment between Loki and his ailing mother. He’s invisible, so that watchful Odin can’t see him, but he reveals that he stabbed his mother in order to save her. Malekith planned to kill her one way or the other, and at least this way, Loki could control what happened to his mom. Now he just needs her to not die for his plans to come to fruition. On Midgard, Thor and Agent Solomon team up to invade Roxxon’s secret, underwater ice lair. They arrive at roughly the same time as the Silver Samurai, whose evil cabal has taken Dario Agger hostage. Thor and the Samurai do epic battle in the lair before he manages to escape. Now our heroes must rescue Agger from the other bad guys, lest his kidnapping failsafe plan goes into effect (a plan that involves destroying Manhattan). This was another one for the win column as the epic story continues to unfold. We’re still in the thick of things, still in the middle of what Aaron and Dauterman are building, and I am definitely enjoying myself. 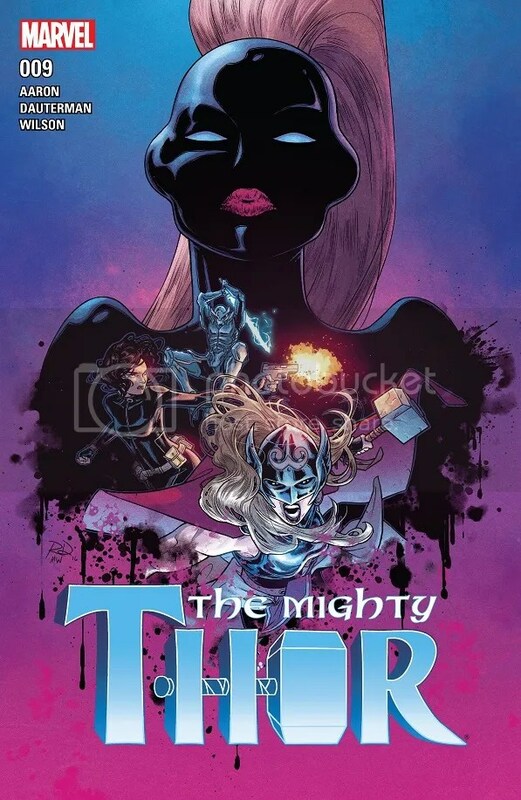 They have truly expanded the Thor comic to include many different characters, concepts and plots, and all of it is pretty fascinating. I’m as excited about Thor and Roz’s rescue efforts as I am about Loki’s secret plans as I am about the machinations of the League of Worlds. This comic is as solid and entertaining as they come, and I’m excited for each and every issue. Though if I had to ask, I’d like a little more personality to Thor. Maybe give her some friends? Or a romance? Or a team-up with Beta Ray Bill? Just askin’. Things are getting pretty hairy for Kamala Khan, and that usually makes for the best stories! 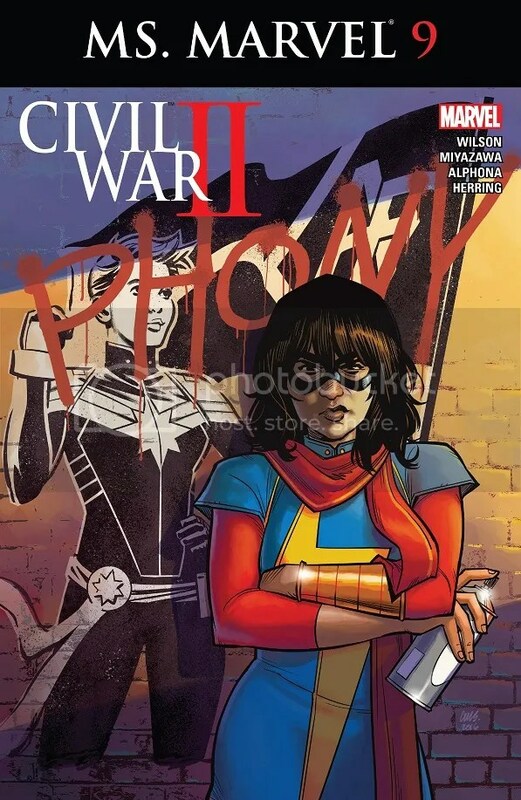 Her heroic idol has taken a firm stance when it comes to future crime, and Kamala isn’t sure if she’s backed the right horse. Poor Kamala. Ms. Marvel and her gang of cadets arrest Josh on the grounds that he was planning to sabotage the school’s electrical grid and cause a meltdown. 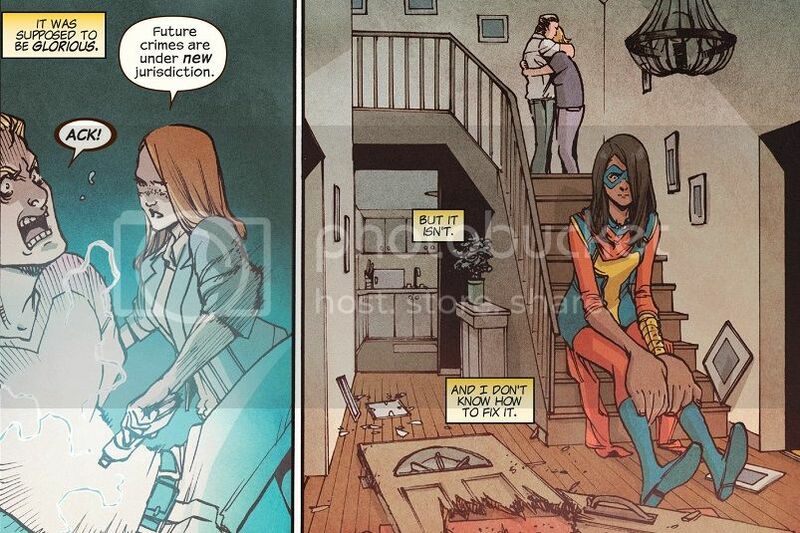 Kamala feels bad that all this pre-crime stuff has resulted in the arrest of her friend, but Captain Marvel tells her that they have to do the right thing, even if it feels bad sometimes. The cadets are stashing the pre-criminals they’ve arrested in a warehouse in Jersey City, and Kamala’s other friends storm in to try and get Josh out. Zoe goes into the cell with him to talk it out, and Josh says he was planning to just cause a little mischief so that everybody would know how much he’s hurting that Zoe dumped him. But she explains that she’s gay, and the end of the world has made her take a different approach to things (she actually has a crush on Nakia). Ms. Marvel shows up to straighten everybody out, since Carol reminded her that she’s in charge of these cadets and what they do. Kamala says they’re going to run this little makeshift prison by the police, but Josh has to stay until the time of Ulysses’ vision passes so that they know for sure he doesn’t hurt anybody. But later that night, Bruno makes a bomb to try and blow through the warehouse door and rescue Josh. Kamala arrives just in time to see Bruno’s bomb go off right in his face, and Bruno collapses. This was a really good issue that got to the heart of this whole Civil War II crisis, and Kamala Khan is a great hero to throw into the mess. The best part of the issue was seeing how this conflict effected Kamala and her circle, from her friends to her family. I especially enjoy seeing Wilson add some real personality and non-Kamala drama to her social circle. It’s nice when great supporting characters can have their own storylines — though now that I think about it, when was the last time Kamala actually got to take part in one of her friend’s storylines? Being the superhero center of the comic, she’s become really separate from a lot of the better developments in her own comic! Their son just got tasered and dragged out of their home by your goon squad, Kamala, maybe you could find a better place to sit? I’m sure that can be rectified in the long run. But slight gripes aside, this was a hard-hitting issue. We got to see Kamala deal with some real responsibility, and the internal conflict over what to do about future crime is expressed quite well through this character. I’m still not entirely sold on the very existence of this cadet group and their sudden, highly advanced, Jersey-specific prison, but I guess I can go with the flow. Ms. Marvel is a worthwhile Civil War II tie-in, and I’m still very excited to see this character get all the attention she’s been given. Also, Wilson and Alphona have been telling this really nice side-story about the origins of the Khan family. That cover says it all! If you were looking for a good examination of male privilege in the dating world, then look no further than Unbeatable Squirrel Girl #10! Also, I can’t believe it’s taken me this long to realize ‘Mole Man’ totally fits into North’s animal-person name ongoing joke. It’s perfect! Mole Man has become infatuated with Doreen, even after she has told him off several times. He has now stolen the surface world’s monuments and won’t return them unless she goes on a date with him. The entire world thinks Doreen should go on the date, but she and Nancy agree that nobody gets to decide who she dates but her! Nancy tries to talk some sense into Mole Man, but he won’t listen to her (also, she may totally have a thing for Doreen herself). So Squirrel Girl burrows down to the Mole Man’s lair once and for all to tell him off, only to be attacked by the monster Tricephalous, who declares that she has always loved Mole Man. This alters Mole Man’s infatuation, and when Tippy notices that Mole Man is now focused on Tricephalous, she suggests Doreen throw the fight. Sure enough, after getting beat up, Mole Man totally cancels their date and starts smooching Tricephalous instead. The day is saved, the monuments are restored, and Doreen realizes that she doesn’t need to get hung up on the dating world. She doesn’t have to prove anything to anyone, least of all herself. So she, Nancy and Tippy head back home to enjoy a nice, relaxing evening. As always, this comic is hilarious in ways I can’t even begin to explain to you good people. Every page has a new joke, and each one is funnier than the last. But it’s not just the humor that makes Unbeatable Squirrel Girl so good, it’s the characters and the story too (so, pretty much everything). North has turned Squirrel Girl from a one-note joke into one of the most fascinating and enjoyable characters in the Marvel Universe! I don’t think I’ve ever seen a superhero whose first move is trying to talk things out. It’s great! Plus she’s got such a wonderful cast backing her up! Every superhero needs a best friend as cool as Nancy. And what makes this even better is the story, which I rather enjoyed. Being a white male, I’m not really one to comment on this kind of privilege, but I’ve read enough of the Internet to understand what the problem is and why Doreen and Nancy are in the right. I love how Squirrel Girl arrives at some profound realizations about herself, and I kind of also love how Mole Man isn’t magically ‘cured’ in one issue, but might hopefully work on his problems in a healthy, loving way. 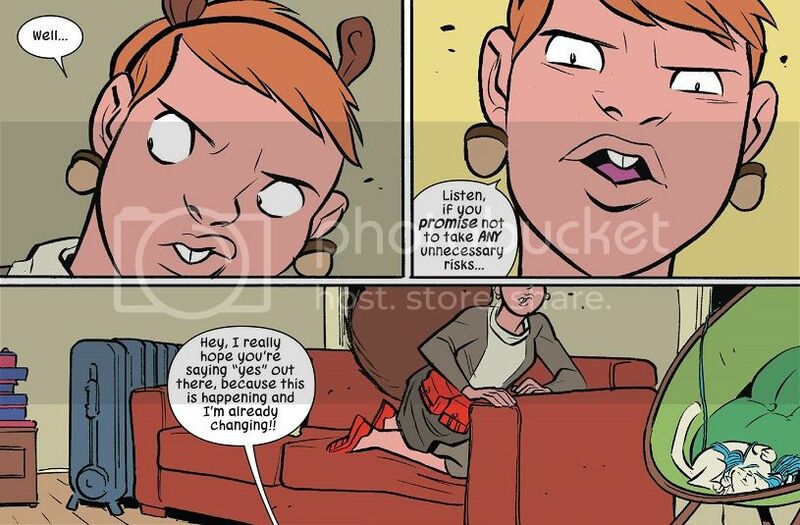 Unbeatable Squirrel Girl has it all: character, story, awesomeness and comedy. And so many squirrels! I applaud Greg Rucka’s interesting take on Wonder Woman in this series. Since DC wants the book to be bi-weekly, why not make it easier on the artist’s wrists by alternating issues between two different stories? Wonder Woman has sought out Cheetah’s help in finding out the truth about her origins, but the Cheetah is a prickly character and needs some persuading. The pair of them are racing through the jungle, pursued by evil beast men, and Diana must help Cheetah overcome her more beastial urges if they’re going to survive. In the end, Cheetah makes Diana promise to help her kill Urzkartaga (the one who cursed her) in exchange for her help. Meanwhile, Steve Trevor leads a band of soldiers into the jungle in pursuit of a man named Cadulo, who has kidnapped a bunch of innocent girls from a nearby village. Steve and his men are captured by Cadulo in the end, but Steve still offers him a chance to surrender. I’m not super familiar with Cheetah’s history, both classic and recent, so I’m not entirely sure how this issue fits into the grand scheme of things. I don’t know this ‘Urzkartaga’ person or why Diana thinks Cheetah can help her find Paradise Island. But I liked the interaction between the two, and deepening their relationship into something more than comic book archenemies. And I really like Sharp’s new Cheetah design (unless he’s just using someone else’s design, then I credit that person). I may not fully understand what’s going on here and why it matters, but Rucka is doing a great job with Diana and the Cheetah so far, so I’m enjoying myself. I’ve got the feeling that this is going somewhere fun. Posted on July 30, 2016, in Comics, DC, Marvel, Reviews and tagged Batgirl, Boom!, Harley Quinn, Kamala Khan, Mighty Morphin' Power Rangers, Mighty Morphin' Power Rangers - Pink, Mighty Thor, Ms. Marvel, Pink Ranger, Squirrel Girl, Thor, Unbeatable Squirrel Girl, Wonder Woman. Bookmark the permalink. 3 Comments. My pull list is very female-heavy, as well. The books that aren’t female leads are minority leads, or teams with large female or minority presence. Thor is good. It has some fun moments. But this arc feels like a bit of a digression. A bit filler-like. Ms. Marvel is great. It deals with the CWII themes well. But mostly I love the support cast here. Zoe coming out to Josh was great, and I love that Ms. Marvel does now have a queer character in the supporting cast. 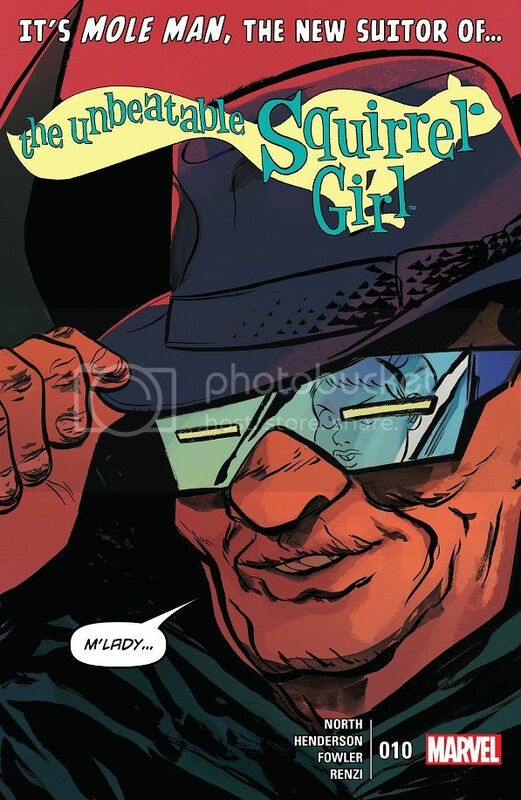 Squirrel Girl is great. Fun and insightful as ever. The idea of the Nice Guy gets skewered beautifully. Nancy refusing to be a damsel is awesome, I love Nancy. That was definitely a very well done moment with Zoe in Ms. Marvel. Quality work there. And you’re right about Thor. I really hope Aaron is going somewhere awesome with all of this. It looks like Greg Rucka is bringing Diana back to those days. Outside of the awful runs of Khaniger, Loebs and Pfeiffer (Amazons Attack! 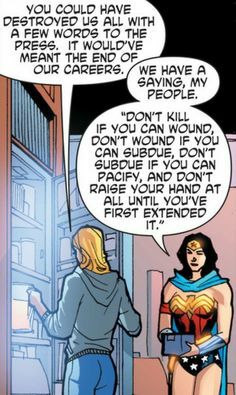 ), and focusing mostly on the Marston, Rucka and Perez runs, I’d say Wonder Woman is perhaps the most unique female superhero precisely because of her compassionate approach.